Today is bittersweet! It's the last day of my daughter being in the first grade. Eek! Where does the time go? Somewhere in between rushing her around to school this morning and dealing with a bit of a family emergency, I had to find time to get some food in my system. 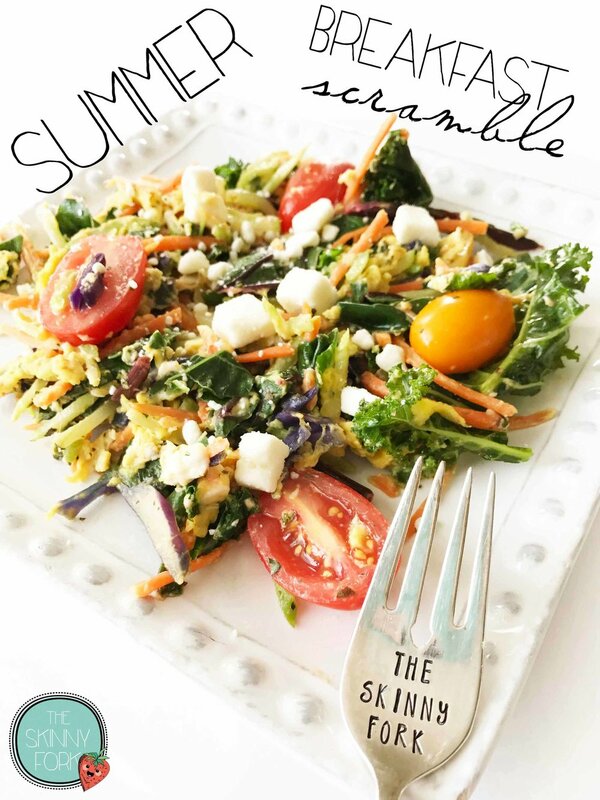 Since we're on the verge of summer, I thought it would be a great time to make myself a fun summer inspired breakfast scramble! I'm calling this a Summer Breakfast Scramble, mostly because I'm making use of some summer greens, light feta cheese, and some tomatoes to boot. I've been on a bit of a breakfast kick lately, can you tell? It's just been eggs on top of eggs on top of eggs around here for the whole week. You can't blame me! The farm fresh eggs got me like 'whoa'. I absolutely love how this scramble turned out so bright and colorful. It just screams SUMMER to me. For my greens here, I used a bagged mix of kale, broccoli stalks, carrots, beet greens, and some radicchio. But, feel free to use whatever greens you have on hand or enjoy the most. Warmed and wilted kale has to be one of my favorite ways to have it. Though, if you're more of a spinach fan, that would be a great alternative! You know how they say to eat the rainbow? Well, I'm pretty sure that I've covered that spectrum here with this Summer Breakfast Scramble! It's fun and bright and sure to put a smile on your face. Dare I say it? This would actually make for a really good camping breakfast too! Lightly coat the inside of a skillet with non-stick cooking spray and heat over a medium-high heat. Toss the mixed greens into the warmed skillet and cook for 1-2 minutes, or until the kale has wilted slightly. Reduced the heat to medium and place the egg into the skillet with the greens along with 4-5 Cherry/Grape Tomatoes, 5 Fresh Basil Leaves, and most of the feta. Cook for another few minutes until the egg has cooked through. Transfer the scramble to a plate and top with the remaining feta.